The students of the DeKalb County School District receive instruction from science specialists that is aligned to the Georgia Standards of Excelence, but goes beyond regular classroom instruction. Programming is designed to motivate and inspire students to learn more about science and how scientists work and to encourage student achievement in science. Teachers are provided professional learning opportunities that are designed by Fernbank Science Center instructors. These programs, experiences and workshops are content based and grade and area specific. Community based programming is developed as part of Fernbank Science Center’s dedication to continued life-long learners of science for the entire family, and includes exhibits, special programming and other learning opportunities. These experiences are intended to connect the scientific community with the public to promote a better understanding of science and the natural world. Fernbank Science Center was constructed on 4 acres of land on the edge of the 65-acre Fernbank Forest. The land was deeded to the DeKalb County Board of Education from Fernbank, Inc. for that purpose. Fernbank Forest was purchased from Col. Z. D. Harrison in 1937 by a group of citizens who were interested in conservation and the preservation of this forest area for science education. In 1964 the Fernbank Trustees developed a 48-year lease which was accepted by the DeKalb County Board of Education. The lease provided for the forest to be used by all citizens of the state and southeast and stipulates that it be protected and maintained by the Board of Education in as near its natural state as possible. The lease required that the forest be fenced and all entry and use controlled and stipulated that no plants or animals be removed. While the lease was for a 48-year period, it was reviewed each year and renewed at 8-year intervals. The Science Center building was completed and dedicated in December 1967. The cost was approximately one million dollars which was provided for in a school bond issue. The original equipment in the Science Center cost approximately 1½ million dollars and was purchased for the most part with NDEA matching funds (half federal and half local). The operational budget for the first three years, which ended on June 30, 1969, was supplied from funds under a grant from Title III, ESEA from the US Office of Education. 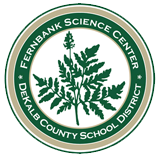 The Science Center now operates on a budget from the DeKalb County School District. By James A. Mackay, Trustee Emeritus Fernbank, Inc.